Ok so this one is japanese language. Nothing too new here, it's just an updated 2010 version of an already available 2009 game. 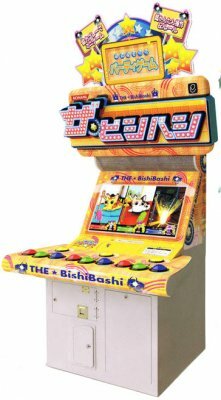 This BISHI-BASHI game is an updated version of the same TTX game version already available! Dump includes exe and dlls, a locale emulator and a launcher taking care of path and other commands and settings to make the game portable & one-click. Note: If game is stuck at boot screen when testing eAmusement, just press SPACE bar to pass... (only with launcher). Game has been tested and working pretty good under Win10 x64. Please note that files are modified and will not properly work on a REAL cabinet. Legend. Thanks so much for the share. Any idea how to map to Xbox 360 controller if this is possible?